North Dakota has only two hardiness zones--3 and 4. Winter temperatures in both zones can get well below zero, and while gardener’s in North Dakota may not have as wide a choice as gardeners just to the south, the flowers that will thrive there are some of the hardiest. Choose a vine for a trellis or along a fence, a shade-loving plant that goes well under tall trees and taller plants for the centerpiece of the garden. Black bugbane (Cimicifuga simplex ‘Brunette’) grows from 59 to 70 inches tall with a spread of 23 to 29 inches. The plant blooms from early to late fall, takes three years to reach maturity and produces large, purple-black leaves and spikes of fragrant, pale-pink flowers. Plant black bugbane in full sun in the cooler areas, partial shade in hotter sections and in an average, moist soil. Black bugbane is deer and rabbit resistant and is hardy in zones three to nine. Dutch crocus (rocus spp. ), also known as spring crocus, is a member of the lily family. 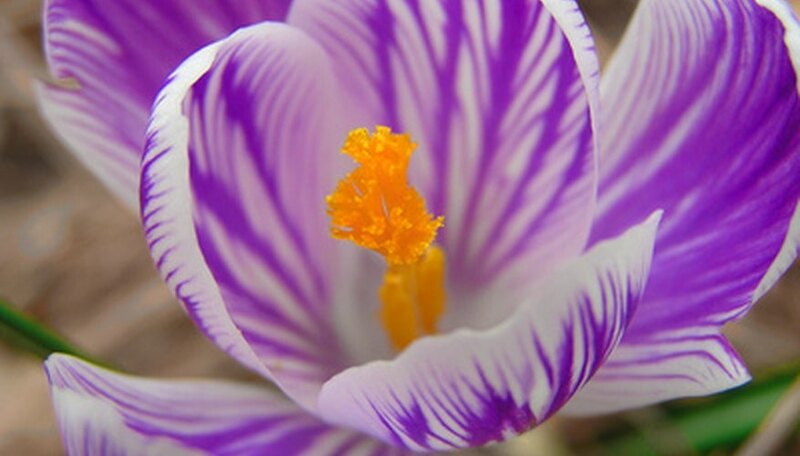 Crocus grow from corms--an underground root that resembles a bulb. The plant produces grass-like leaves, and from one to six small, wine-glass shaped flowers in solid colors, stripes or bi-colored. Crocuses can be either spring or fall blooming. Plant crocuses in full sun or partial shade. The flowers are hardy in zones three through eight. Dutchman's pipe (Aristolochia macrophylla) is a deciduous vine that grows from 20 to 30 feet long with deciduous, medium-green, heart-shaped leaves that grow from 4 to 10 inches long. Small, yellow, pipe-shaped flowers bloom in May and give way to brown fruit that's 2 to 3 inches long. Plant Dutchman's pipe in full sun or partial shade and in a moist, well-drained soil. The plant is hardy in zones 4 to 8. Lenten rose (Helleborus orientalis) is a member of the buttercup or crowfoot family that grows from 16 to 20 inches high. The plant features dark-green leaves that grow up to 18 inches long and 16 inches wide. The white, pink, rose or purple flowers grow from 2 to 3 inches across, grow in clusters and bloom in the winter. Plant lenten rose in partial-to-full shade and in a moist, well-drained soil. The plant is hardy in zones 4 through 9. What Flowers Survive in Cold Weather?